Temecula, Calif. – BioSupply Trends Quarterly (BSTQ), a publication by FFF Enterprises, Inc., received first place in the "Magazines: Health & Medicine" category in the San Diego Press Club's 43rd Annual Excellence in Journalism Awards. The article recognized for this award, "Irreproducible Research: The Need for Study Validation," was written by contributing writer Jim Trageser. "It's an honor for our magazine to be recognized for an article that raises important issues surrounding scientific research methods. Jim has been a long-time contributor to BSTQ, and this is but one article that showcases his impressive in-depth reporting of critical topics in the medical community," says Ronale Tucker Rhodes, MS, editor of BSTQ. "We are very happy to receive this recognition by the San Diego Press Club. It's an honor to know that the timely information we are providing is received positively, not only from our audience in the biopharmaceuticals industry, but also from the professional journalism community," remarks Patrick M. Schmidt, chief executive officer of FFF Enterprises. BSTQ's inaugural issue was launched in July 2009 and now reaches more than 50,000 subscribers, including national distribution to general practice physicians, hospital and clinic chiefs of staff and buyers, pharmacy managers and buyers, specialist physicians and other healthcare professionals. It recently launched a "Go Green" campaign to its readers to encourage digital subscriptions and reduction of unnecessary paper. BioSupply Trends Quarterly (BSTQ) is a quarterly magazine published by FFF Enterprises, Inc. BSTQ has a national distribution to general practice physicians, hospital and clinic chiefs of staff and buyers, pharmacy managers and buyers, specialist physicians, and other healthcare professionals. 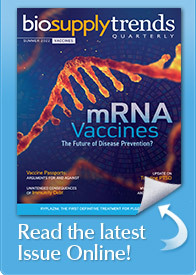 The publication's mission is to serve as the industry's leading resource for timely, newsworthy and critical information impacting the biopharmaceuticals marketplace, while providing readers with useful tips, trends, perspectives and leading indicators on topics pertinent to their business. FFF Enterprises is the largest and most trusted distributor of plasma products, vaccines, biosimilars and other specialty pharmaceuticals and biopharmaceuticals. Founded in 1988, FFF is now in its 28th year with annual sales approaching $2 billion and a flawless safety track record for product distribution. FFF has taken a leadership position in regard to supply chain safety and innovation, setting new standards and pioneering industry firsts. FFF's commitment to Guaranteed Channel Integrity™ ensures that products are purchased only from the manufacturer and shipped only to licensed healthcare providers, with additional steps taken to safely store, handle and ship products to ensure patient safety is never compromised. FFF's proprietary systems - Verified Inventory Program-Consignment (VIPc™) and Lot-Track®, provide verification of this secure channel, BioSupply® online ordering system offers an easy-to-use and convenient platform to order products, and MyFluVaccine™ is a revolutionary vaccination program that has added a new level of safety, convenience and reliability to both healthcare providers and patients.